Did you reach your business & personal goals this past year? Are you ending up where you expected, worse than you thought, or in a different but better place? I hope that you can find some space to look back on your year and make some small course corrections for the new year. I traveled over Thanksgiving 2014 (for 18 days to San Francisco, my favorite place!) This gave me some space to reflect back on what I expected and to do some planning for next year. I find that travel (plane, train or auto) gives me some space to think about my goals. If your life is anything like my life, then your year will be full of both new opportunities and unexpected distractions. Lean into this and plan for it, and you’ll be able to navigate anything that comes your way! Often I find that people’s overwhelm is a direct result of the unexpected—illness, opportunities changes in business plan, family priorities. For example, I had some unexpected medical challenges but also unexpected successes along the way. So what if you EXPECTED that it won’t be a straight path? Just because it’s a new year does not mean the pattern changes! Let’s say you want to make 6-figures this year. Instead of focusing on this end result, shift your focus to the smaller, do-able things that will result in your larger goal. 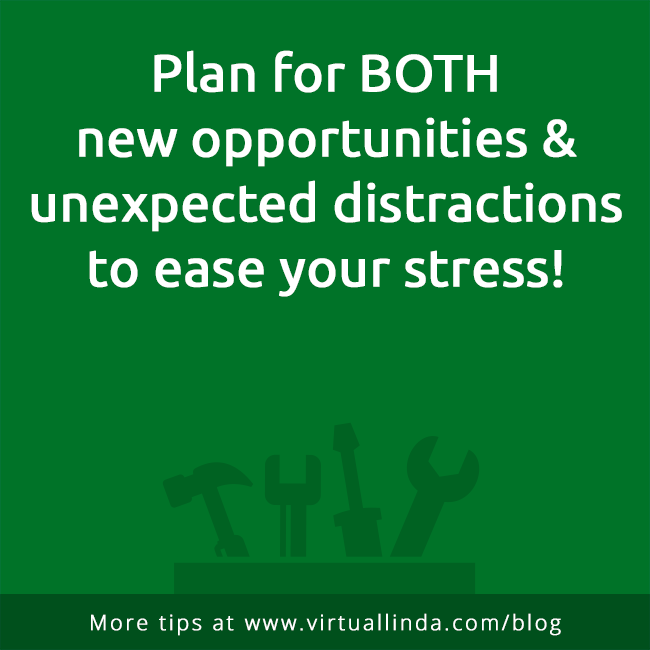 Both of these plans can easily adjust to reaching the goals quicker than expected OR unexpected life changes. The bigger goal has been broken down into S.M.A.R.T. goals — Specific, Measurable, Action-oriented, Realistic and Time-based — which allows for check point along the twisted path. This will also lead you to opportunities that are a natural result of the steps forward you are taking. Most of my opportunities were not on my radar at all last January. However, they were the result of the strong foundation I’ve been creating for the last several years. So the big wins were not really out of the blue, it was the result of the strategic planning I had been doing and implementing all along. Many of these will be opportunities that find YOU, especially if you combine this progress forward with your online brand. With your message online 24/7 AND small steps forward for 52-weeks of the year, you can’t help but make 2014 a great year! For example, I did a social media workshop at the AGU Meeting (American Geophysical Union) for science, technology, education & math educators. This was the result of many byte sized steps with making connections in the STEM community and building the reach of The Sun Today, a solar & space weather community I co-founded. As you are making your New Year’s Resolutions, make sure they are S.M.A.R.T. — you will dramatically increase your chances for success. Don’t worry, if you ever find your goals are too easy, then you can always kick them up a notch. But it’s much better to be successful than to fail from the start. Even better, make your resolution checking your S.M.A.R.T. goals every 30-days & you’ll really accelerate your success!